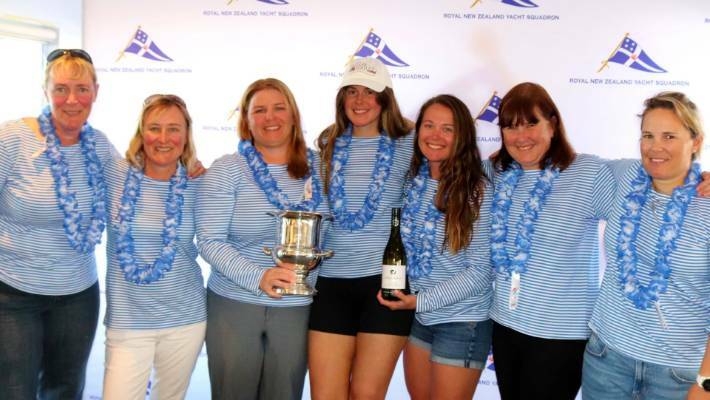 Sally Garrett's crew, who first sailed together 20 years ago, lead the fleet during their maiden victory in the NZ women's keelboat champs on the Waitemata Harbour. This story was originally published on Locker Room and is republished with permission. There was something extraordinary about Sally Garrett's victory in the New Zealand women's keelboat championships last weekend. To start with, the nucleus of her crew were old friends from the Royal Akarana Yacht Club who'd first raced together in 1999. And this was their first national title. But what few of her competitors knew was that Garrett, the crew's skipper - and a scientist who studies waves in the Southern Ocean – was hurting whenever the winds rose out on the Waitemata Harbour. ​Her pain stemmed from an accident a month earlier, when Garrett was halfway into her voyage racing around New Zealand. She was just off Stewart Island when her boat slewed onto its side in a 'Chinese gybe'. Her left arm was flung backwards in the accident - the elbow hyper-extended, and her biceps tendon partially tore off the bone. But Garrett, 42, kept on sailing with her race partner Rob Croft, and became the only woman to complete the Two-handed Round New Zealand race twice. (In fact, she's the only woman to have ever finished the race, full stop). The injury flared up again on the final day of the three-day national women's keelboat regatta, when she was steering a 10m Farr MRX boat in gusty winds. But again, Garrett quietly carried on. "It's why she's one of the toughest people I know," says Garrett's long-time crewmate Sarah Ell. She also describes Garrett as "a very calm, happy, relaxed presence on the boat. It sets the tone, so there are no prima donnas in our crew". Garrett is having treatment on her arm, but the exhilaration of last weekend's victory is pushing the pain to the back of her mind. What made winning the keelboat title so rewarding for her was doing it with a cluster of women she'd first sailed with 20 years ago. After a hiatus of 11 years – when they were otherwise occupied raising children, contesting an Olympics, or sailing offshore - they "got the band back together" last year, and now have finally won the title. "It's a bit of a cultural shock, after going around New Zealand and being the only female competitor!" laughs Garrett, a former commodore of Royal Akarana. Garrett's crew were playing their part in a major revival of women's keelboat racing. Thirteen crews - more than 90 women - competed in the nationals this year, after years of much smaller fleets. "While we were going through our 'lost years', when we weren't racing together, women's keelboats went through their own lost years," explains Ell, who has two young children and has authored numerous books on sailing and New Zealand's marine history. "Then they got some women sailors together and asked 'What's going on, what would make you come back?'" The most significant change was to make chartering the race boats affordable. "You pay $1000 for the season and your entry to nationals, instead of $200 a night to race every second Tuesday," says Ell. "It's brought a lot of women who were no longer sailing out of the woodwork. The top three crews had a lot of older women in their 40s and 50s. It's great we're still out there doing it." This year, Garrett's crew won the summer series in the lead-up to the nationals. Then they broke the dominance of skippers Karleen Dixon and Melinda Henshaw, who've battled it out for the national title rights over the last four years. Twenty years on from her first attempt, Garrett says it feels like it's getting easier to compete. "Easier because we have really strong sailors. It's all about putting the puzzle together," she says. Among the crew who originally sailed together were Ell, Christine Weston - who by day is an independent clinical research consultant, and a mum - and Sara Winther, who sailed at the London Olympics in 2012. On the mast, Jenny Price had sailed with Garrett for years in the two-handed Flying 15 keelboats. The NZ women's keelboat champions (from left) Jenny Price, Sarah Ell, Sally Garrett, Emma Stenhouse, Alison Kent, Christine Weston and Sara Winther. Winther, now 37, sailed her first keelboat nationals with the crew in her first year out of high school. She's recently returned from coaching sailing overseas, and is now studying post-graduate psychology. "It was great having Sara, who's experienced the pressure of an Olympics, now coaching us," Garrett says. But Garrett shrewdly brought on two younger sailors to carry out the physically demanding work on the bow: Emma Stenhouse, 21, who's making a name for herself in the 49er FX class; and American sailor Alison Kent, 25, who was part of the NZ women's match-racing team, and is an apprentice sail maker in Auckland. (Turns out, she made the sails for Garrett's Round NZ campaign). "Sally is one of those people who wants everyone to stay in contact, helps keep them sailing and finds opportunities to do so," says Ell. It was important to Garrett when pulling her crew together that she found "good sailors who'd dropped off" the sailing scene, rather than rustle them from other women's crews. 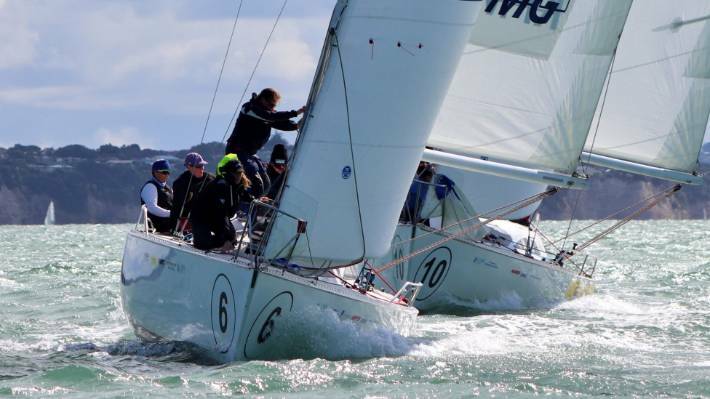 In winning, Garrett's crew are invited to sail against male crews in the NZ open keelboat championships at the Royal New Zealand Yacht Squadron, later this month. Garrett is no stranger to making her mark at sea. In 2016, she became commodore of the Royal Akarana Yacht Club - only the second woman to ever do so. She was the first woman to complete the longest sailing race in the country, the Round NZ race, back in 2012. She holds very few fond memories of that circumnavigation: "It was incredibly rough. I nearly gave up sailing, we had such a dreadful time." And yet, she returned this year, once again with Rob Croft on board Expedition Coppelia, an 11.6m sloop. "There were a couple of rough days of 40 to 50 knots [of wind] off Milford Sound, with massive seven metre seas," Garrett says. "But it was great this time - all the boats were the same size, so we actually raced around the country, rather than just sailed." They won the final leg into Auckland, and finished third overall on handicap. An offshore sailing enthusiast, Garrett has around 40,000 nautical miles under her belt. A past race director for the Auckland-Fiji race, she plans to sail in this year's Sydney-Hobart for a second time. Her first assault, in 2017, ended prematurely when the yacht she was on, Imalizard, dismasted in Bass Strait. While the opportunity to circumnavigate the globe has yet to arise, Garrett says if she ever did, she would "think about it seriously". Even though she knows, through her day job, just how terrifying the waves in the Southern Ocean are. Garrett is an environmental scientist who works at the Defence Technology Agency at the Devonport naval base. Studying waves in the Southern Ocean, she installed a measuring buoy off Campbell Island in 2017 to improve forecasting in that remote part of the world. Last year, it recorded a monstrous 23.8m wave - the largest ever recorded in the Southern Hemisphere. "Luckily, I wasn't there," Garrett laughs. Her professional expertise undeniably assists her in sport. "To do two-handed sailing, you need to bring a skill to the boat. That skill for me is looking after the electronics and navigating, and meteorological knowledge," she says. Ell agrees: "Even on the harbour, Sally knows what the tides are doing out here, and her knowledge of tide, wind and weather really helps our team." There are other ways she can get her work and sailing lives to interlace. Garrett and her partner, Neil Easton, have qualified for the world Flying 15s championships in Ireland in August. It coincides nicely with a scientific conference in Hudson Bay, Canada, on Arctic waves and sea ice. Garrett reckons she can make it work. This story was originally published on Newsroom and is republished with permission.